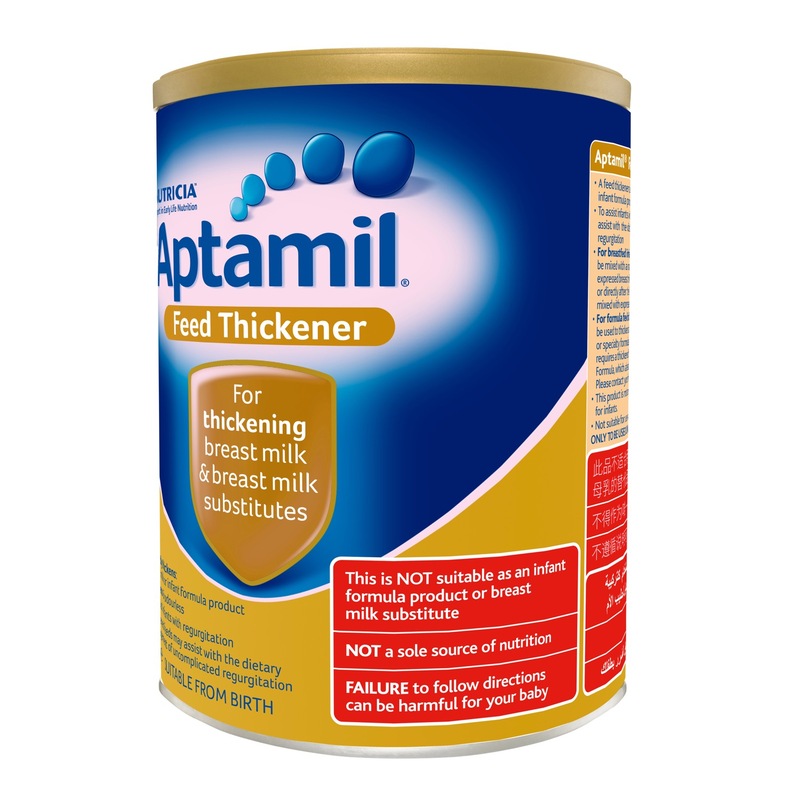 Aptamil® Feed Thickener is a thickening agent and may be mixed with breast milk or infant formula to assist in the management of regurgitation. In all cases it should only be used under medical supervision. Do not use if foil security seal is damaged or missing. Follow instructions as recommended. Do not change proportions of powder except on medical advice. Use expressed breast milk, or prepare formula as directed. Add to the bottle, 1 scoop (4g) per 100ml of breast milk or formula. Shake vigorously. A medium-fast flow teat is recommended unless otherwise advised. Follow instructions as recommended. Do not change proportions of powder except on medical advice. Note: All formula feeds should be prepared immediately before feeding baby. Do not prepare thickened feeds in advance as thickness will increase on standing. Discard unfinished feeds. Store in a cool dry place. Use by the date on container bottom. After opening, keep container airtight and use contents within four weeks. Some settling of the powder may occur. 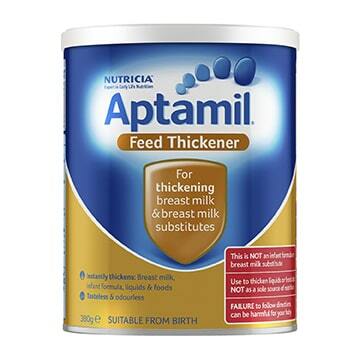 Aptamil Feed Thickener 380g is rated 5.0 out of 5 by 6. Rated 5 out of 5 by Bree15 from Amazing product! I bought this to see if it would help with my baby who had reflux and my god she is a whole new baby after adding this to her formula. She sleeps amazing, I’m able to actually put her down down without her screaming the house down every single time. She is just happy and it’s all thanks to this thickener! 1000% recommend! Rated 5 out of 5 by Meagan1504 from Great product This product has completely stopped my boy from spitting up after feeds. Rated 5 out of 5 by Tashg from Works well I bought this because my son has reflux and I wanted an affordable way to treat it and didn’t want to change his current formula. Since he has had the thickener in his formula he has stopped vomiting.